The town of Taal, circa 1903. Image source: Official Handbook of the Philippines and Catalogue of the Philippine Exhibit. As tends to happen when scans are made on books, the end result tends to be somewhat grainy as evidenced by the picture above. It has been processed using graphics editing software to improve quality, but software can only do so much if the original photograph is not of the highest quality in the first place. The picture above has been colorized courtesy of Algorithmia. Below is the original black and white version taken from the book. 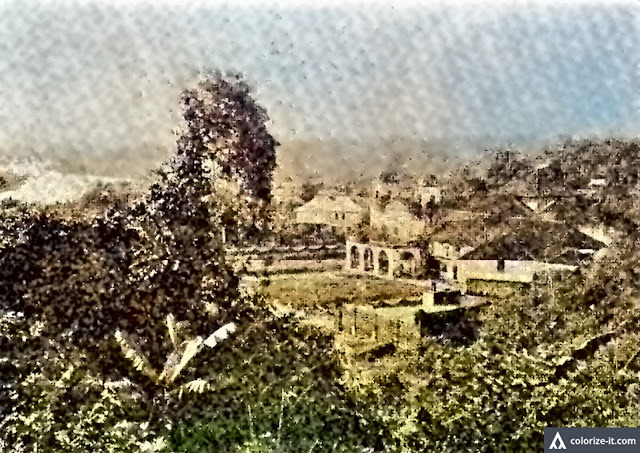 The original gray scale version of the top photograph.